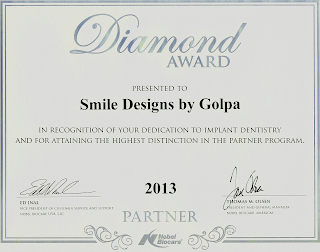 At Dr. Golpa’s Dental Implant Center we use only proven technology and proven materials, in order to provide our Patients the highest level of care. If you are looking for the best dental implants there are some things you should know. Nowadays there are more than 150 different companies producing dental implants, those that have been on the market for 20+ years and the really young ones. The secrets of titanium alloy used for implants were released a long time ago. And basically the type of alloy used for implants is the same in every company, but the major differences include: the type of the production, quality of implant surfaces, and biocompatibility of this surface with bone and soft tissue, biomechanical behavior of implant components, and the most important factor - long-term research. There are 3 strongest companies in the world: Nobel Biocare, and Straumann, Astra. These companies have invested millions of dollars in their research for decades and became the most published, safe and predictable. Likewise, Dr. Golpa has invested millions of dollars in equipment, facilities, and advanced training to insure that he provides his Patients the highest level of care. There has been a rise in companies that have taken the technology and produced cheaper implants, that are not bad as well, but Dr. Golpa only uses products are from companies who are able to give best product support, and predictable results from proven research. Dr. Golpa uses Nobel Biocare NobelActive Dental Implants, NobelActive is a unique, next-generation bone-level dental implant. NobelActive 3.0 was named “Best Product 2012″ in the September issue of Dental Product Shopper, a renowned publication in the United States, which focuses on in depth reviews of dental products. This is the highest accolade given by Dental Product Shopper and is reserved only for products that achieve very high scores in the clinician evaluation process. This award follows two recent awards, also from a well-known US publication, where the innovative NobelActive implant system was named to Dentistry Today magazine’s “Top 100 Products 2012″ in the July edition and “Top 25 Implant Products 2012″ in the May edition. If you need Dental Implants, the quality of the Dental Implant is a crucial factor in determining the longevity of your restoration. For Dental Implants that will last a lifetime trust the proven technology behind Nobel Biocare and The Golpa Dental Implant Center.